The 35th Infantry Regiment Association salutes our fallen brother, SP4 Daniel Morris Noeldner, who died in the service of his country on March 6th, 1969 in Pleiku Province, Vietnam. The cause of death was listed as Multi-Frag. At the time of his death Daniel was 23 years of age. He was from South Shore, South Dakota. Daniel is honored on the Vietnam Veterans Memorial at Panel 30W, Line 55. The decorations earned by SP4 Daniel Morris Noeldner include: the Combat Medical Badge, the Distinguished Service Cross, the Purple Heart, the National Defense Service Medal, the Vietnam Service Medal, the Vietnam Campaign Medal and the Vietnam Cross of Gallantry with Palm Unit Citation. Daniel is buried in St Lukes Lutheran Cemetery, Codington County, SD. Daniel was awarded two Purple Hearts. 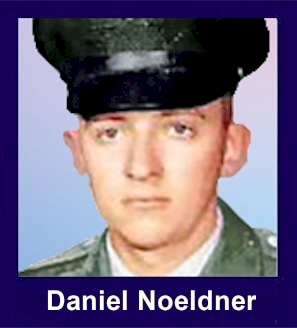 Sergeant Daniel M. Noeldner, United States Army, who distinguished himself by extraordinary heroism while serving as a senior medical aidman assigned to Headquarters and Headquarters Company, 2d Battalion, 35th Infantry, near Pleiku, Republic of Vietnam, on 6 March 1969. On that day Sergeant Noeldner was serving with Company D, 2d Battalion, when it was ambushed by a force of the North Vietnamese Army. Several men in the point element were hit by the initial volley of fire and the cry for "Medic" was heard. Completely disregarding the intensity of the enemy attack and his own safety, Sergeant Noeldner rushed forward to the side of his wounded comrades. While treating the first man that he reached, he was wounded in the thigh. Refusing medical treatment for himself, he continued to assist the wounded while repeatedly exposing himself to the fire of the enemy force. Shortly thereafter he was again hit by enemy rounds while assisting his fellow soldiers. While attempting to bandage himself to stop the profuse bleeding another medic came to his aid, but Sergeant Noeldner directed him to check the other injured men. Although the crippling effect of his wounds prevented him from continuing his gallant mission, Sergeant Noeldner had significantly contributed to saving the lives of two men at the sacrifice of his own. His extraordinary heroism at the cost of his own life, above and beyond the call of duty, was in keeping with the highest traditions of time United States Army and reflects great credit upon him and the Armed Forces of his country.